The framework would particularly benefit those with incomes greater than $1 million. 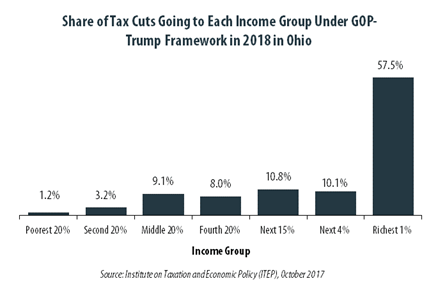 These households will make up just 0.5 percent of Ohio’s population but would receive 48.5 percent of the tax cuts if the plan was in effect next year. This group would receive an average tax cut of $99,700 in 2018 alone, which would increase their income by an average of 4.4 percent. The middle fifth of households in Ohio, people who are literally the state’s “middle-class” would not fare as well. Despite being 20 percent of the population, this group would receive just 9.1 percent of the tax cuts that go to Ohio under the framework. In 2018 this group is projected to earn between $38,700 and $58,900. The framework would cut their taxes by an average of $460, which would increase their income by an average of 1.0 percent. 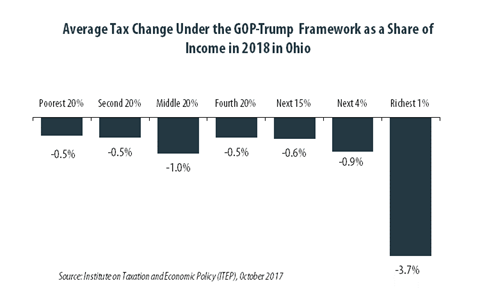 If the framework was in effect in 2018, 14.9 percent of of Ohio households would face a tax hike. Whether a family would pay higher or lower taxes would depend on their circumstances. There are two provisions that reduce the amount of income that is subject to taxes for most families, and the framework increases one of them (the standard deduction) while repealing the other (the personal exemption). Families who itemize their deductions (rather than claming the standard deduction) may pay higher taxes beause the framework repeals most itemized deductions, including the deduction for state and local taxes.